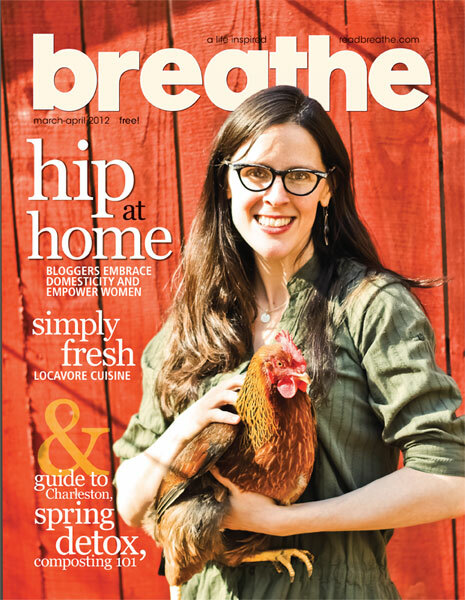 Last week we sent the March/April issue of Breathe to press. I am so excited about this issue. The content and art is thoughtful and uplifting. Our cover story is about this idea of a new era of domesticity and how female bloggers are at the forefront, paving a way for women through their DIY and homesteading blogs. Really great story. It features Jessie Knadler who lives in Lexington County, Va., and Ashley English who lives in Candler, N.C. Both blog and publish books relating to the work they do on their homesteads. I’m really excited about the cover of the magazine. It features Ashley. It’s an attention grabbing pictures. She looks warm, happy, beautiful, totally cool — an icon for the young, hip homemaker. The issue also features stories on locavore cuisine and recipes, the Mountains to Sea Trail, the Hill City Master Gardeners in Lynchburg, Va., eco-friendly beauty products, book reviews, DIY projects, Certified Wildlife Habitats, detoxing, adventure races, Charleston, S.C., and a wedding lookbook. It will be hitting newsstands in the next two weeks. Go out and grab a copy! Hope you enjoy it!